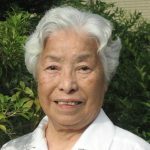 For Japanese Good Samaritan Sister Theresia Hiranabe, the seventieth anniversary of the end of World War II is a timely opportunity to share her “dreadful experience of war” and how it led her to the Good Samaritan Sisters. The seventieth anniversary of the end of World War II is a good reason to tell my dreadful experience of war – and in the end – how it led me to the Good Samaritan Sisters. On December 8, 1941, Japan attacked Pearl Harbour. This brought Japan into World War II. At that time I was eight years old and living in Manchuria. My family had moved to Manchuria from Tokyo in 1938 when I was six. There, we lived in Botanko, very close to the Russian border, and my father worked for the army. As the war progressed, we began to hear about the bombing of Tokyo, Osaka and other industrial cities in Japan. We also heard how people were suffering from shortages of food and other necessities of life. In Manchuria, however, we were a long way from the battles and did not suffer like that. But on August 8, 1945, life changed dramatically for my family. At 5:00am I was woken by a terrible noise. People were shouting that Russia had declared war on Japan in Manchuria. That same day, in the afternoon, Russian B-29s crossed the border and began dropping bombs. That evening, Russian tanks invaded Manchuria and a fierce battle was fought; the Japanese forces were defeated. Earlier in the day the evacuation of civilians had begun. As we were waiting for cars to take us to the train station, the bombers came over Botanko. At that moment we became refugees: my mother, my younger brother and me. My elder brother, who had just turned 18, had been called up for military duty along with all male students. It would be some years before we would meet him again. There was no time to say goodbye to friends or teachers; I have never met any of them since. When we got to the station there were thousands of terrified people crowding the platform and struggling to board the waiting train. We thought ourselves lucky to get onto the train, even though it was a roofless goods wagon. The train was packed but did not leave until the next morning. Just before our wagon left my father found us to say goodbye. He promised to come to us as soon as he could. It was August, mid-summer and very hot as we made our journey. Every day there were sudden showers. In our open wagon we got very wet, but dried out quickly in the hot sun. It took two weeks to reach Shinkyo (now Chosum), the capital city of Manchuria. The train was slow and stopped often. At these stops we were able to buy food from Chinese farmers. Since ours was the first train to leave Botanko we were spared the bombing by Russian planes. Later trains were bombed, killing many women and children. When we arrived in Shinkyo on the morning of August 15, 1945, we were told over a loud-speaker that at noon there was to be an important announcement. I felt uneasy and fearful that something might happen to us and it came over like a shadow on my heart. Then at noon, we heard the voice of the Emperor announcing that Japan had accepted the Potsdam Declaration and that the war had ended. Everyone knelt down on the ground and wept. We all asked ourselves, “what shall we do?” I still remember this terrible despair. We did not stay in Shinkyo. The train moved on that afternoon and, a week later, we arrived in Hoten. Everywhere we looked we saw Russian soldiers. We were so frightened. I still feel that fear when I think about it. Even now when I hear the sound of a big truck, I’m reminded of that fear. After we had been in Hoten awhile, we women and girls were each handed a pistol in case of an attack by Russian soldiers. That made us even more frightened, but fortunately we did not have to use it. The situation was very uncertain. Russian soldiers were everywhere but they did not have total control of the city. The Japanese army did what they could for us. At first we were given shelter in an army building. I remember feeling safe on the ninth floor. But every day the number of refugees increased, and two weeks later, we were all moved into a school. There were thousands of us. Although Hoten was a Japanese city, it was not safe for us. The Chinese, who had been invaded by the Japanese forces, took their revenge by looting and burning Japanese houses. Winter comes early in Manchuria. November 1945 was a freezing winter, with temperatures ranging from -10 to -30 degrees. Every day groups of settlers – women, children and old men – arrived from the north, having walked through the snow. They had lost everything as a result of the Russian invasion and Chinese rioting. Many died of hunger; babies died on their mother’s backs. One mother asked a man to bury her beside the mountain path. Then she killed her small child who was dying after which she herself died. Towards the end of the year my father came to find us. He found us a place in a Chinese hotel. He also got work with a Chinese employer and we began to have hope of getting back to Japan. But in early 1946, my father caught a cold, or so we thought. Sick with typhus, he died on January 12. My mother, who had nursed him, also caught typhus and died a few weeks later on March 4. My ten-year-old brother and I (now 13) were orphans. Before my mother’s death, the Chinese man my father worked for helped my mother with the cremation of my father’s body. I wanted to put his ashes somewhere holy so I went very secretly to the temple and when I thought no one was watching, I dug a little hole and left them there. There were many orphaned children like us. We were not left without help. Much of it came from a Zen Buddhist temple where people made sure we had food and shelter, and arrangements were made to get us to Japan. We went on the first ship to sail to Japan after the war. It took a week. We were looked after by the Japanese Welfare Authority. Most of the children were taken by their relations. Two months later my elder brother returned to our home town in Hokkaido. When he heard about our parents’ death and that my young brother and I had returned to Japan, he came to Hakata to take us to Hokkaido. This elder brother died two years later. While waiting for our relations to take us we went to school. One of the teachers there was a Catholic lady, Setsuko, who cared for us as well as taught us. She had been baptised by Father Flynn, an Australian priest in Hakata. He was one of the Australian priests who responded to the appeal of Bishop Yamaguchi of Nagasaki to help rebuild his diocese after the devastation of the 1945 atomic bomb. Father Flynn introduced Setsuko to the Good Samaritan Sisters who had also responded to Bishop Yamaguchi’s appeal. Setsuko worked with the Sisters in Nagasaki and later in Sasebo at their newly established kindergarten. I had been in Hokkaido for five years and was wondering what to do with my life. Setsuko invited me to Nagasaki and it was there that I met the Sisters. I still remember the strong impression they made on me. I was not Catholic, but felt something happened to me. I began learning about the Christian life. Two years later I went to Sasebo and worked with the Sisters. On Christmas Day 1952 I was baptised in front of the Sisters. I had a wish to join them. It kept growing, but many obstacles were in my way: my poor health, due to lack of nourishment because there was no good food in Japan; I had no money because I didn’t have parents; and my education had stopped because of the war. When I visited the Sisters again, they were busy with preparations for the opening of Seiwa High School and I was asked to help. I had no special reason to refuse, so accepted. Whenever people sympathise with me for what I suffered in China, I answer in my mind: Japan did serious wrongs as a colonial ruler. When Japan invaded China and Korea, millions of people suffered terrible pain. I offer my sufferings in China, the death of my parents – the loss of everything, as compensation for what Japan did. It is my small sacrifice. Good Samaritan Sister Theresia Hiranabe has a background in secondary school teaching, adult faith formation and pastoral work in Japan. Now retired, she lives in Nara and is involved in adult faith formation, catechetics and scripture studies.